The U.S. debut of the Mirage took place today at the New York International Auto Show (March 28, 2013). Official press release is posted below. We already knew many of the car's specs from the Canadian market car (which was announced in January). The car was designed from the outset to be very economical. It has a remarkably light but strong body with a curb weight of around 2,000 lbs, which makes it the lightest 4-door car in the U.S. Aerodynamic optimization gives in one of the lowest coefficients of drag among cars in its class (cD of just 0.28 for the U.S. model), which helps both fuel economy & high speed performance. The car is selling well around the world: as a "global" car (manufactured at Mitsubishi's facility in Thailand), there are waiting lists in Southeast Asia (Philippines - where it won Car of the Year in its class - Malaysia, Thailand). Early sales reports are encouraging from Australia and the U.K. as well. Mitsu is already planning to increase Mirage production to meet demand. Mitsubishi Motors North America, Inc. (MMNA) has unveiled a remarkably fuel-efficient all-new 2014 Mitsubishi Mirage 5-door subcompact at the 2013 New York International Auto Show that is expected to arrive at Mitsubishi Motors dealers later this fall. The all-new 2014 Mitsubishi Mirage model is expected to achieve a lofty manufacturer estimated fuel economy of 40 mpg combined/37 mpg city/44 mpg highway (CVT-equipped model; pending EPA fuel mileage rating), making this stylish new vehicle the most fuel-efficient non-hybrid gasoline vehicle available in America. 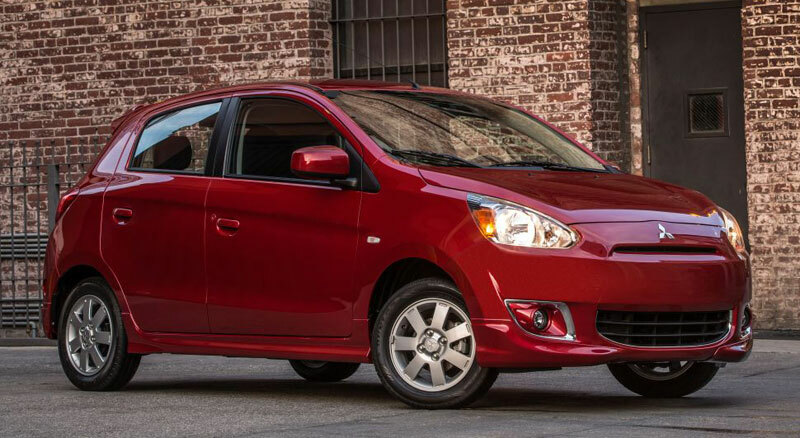 In addition to its exceptional fuel economy, the all-new 2014 Mitsubishi Mirage will be offered exclusively in a convenient 5-door configuration with room for five passengers. Making a triumphant return to the North American marketplace, the all-new 2014 Mitsubishi Mirage 5-door sub-compact is the most fuel-efficient non-hybrid gasoline vehicle available in America. 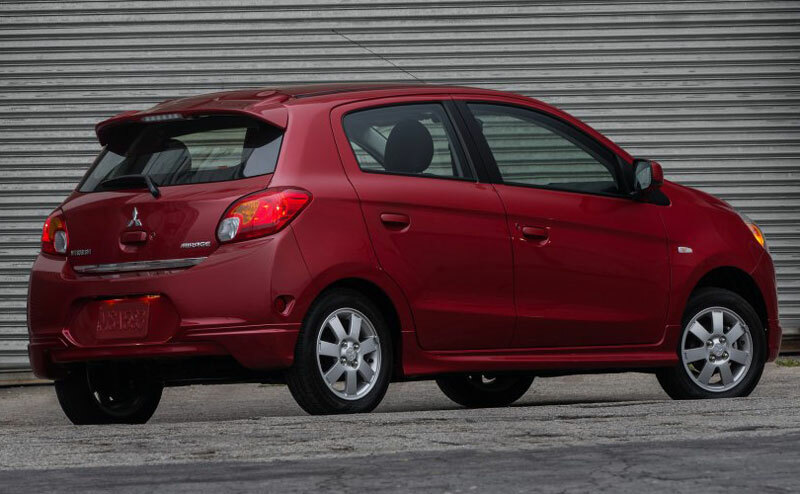 With a manufacturer-estimated fuel economy of 40 mpg combined/37 mpg city/44 mpg highway (CVT-equipped model; pending EPA fuel mileage rating), the all-new Mirage is an affordable and stylish hatchback with best-in-class fuel efficiency. The all-new Mirage provides eager acceleration in urban stop-and-go driving along with exemplary highway fuel economy. What's more, an ECO indicator illuminates to let the driver know when they are driving in a manner that allows for utmost fuel efficiency. 4-wheel anti-lock brakes (ABS) with Electronic Brake-force Distribution (EBD); and Brake Assist. Hill Start Assist (HSA) is also standard on all continuously-variable transmission-equipped (CVT) models. Active Stability Control (ASC) with Traction Control Logic (TCL) is also included on all models. The ASC/TCL helps stabilize the vehicle when it detects skidding and/or when the system detects a loss of traction on slippery road surfaces. Mitsubishi Motors engineers have fortified the all-new Mirage 5-door with an additional level of driver and passenger protection (the Mirage has seating for 5) in the event of a collision by incorporating the most advanced form of Mitsubishi's RISE (Reinforced Impact Safety Evolution) impact-absorbing safety cell technology ever. The patented RISE system utilizes a body structure with an impact energy-absorbing front end along with an abundant use of high tensile steel in key areas throughout the platform. 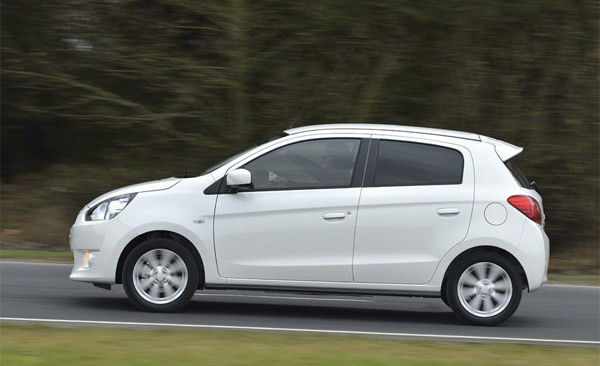 Furthermore, the stylish exterior of the all-new 2014 Mirage was penned using computer-aided design (CAD) software to maximize the 5-door's aerodynamic efficiency for a low 0.28 coefficient of drag. This advanced design/emphasis on aerodynamic efficiency is clearly exhibited in the carefully sculpted corners of the rear bumper and the way the hood gently flows into the A-pillars. To add a touch of vibrancy to Mirage's dynamic exterior styling, four fun and eye-catching colors will be available in addition to the traditional selection of White Solid, Black Mica, Silver Metallic, and Gray Mica. Standard electric power steering (EPS) further aids the fuel efficiency cause while providing the driver with communicative steering feel as well as the sharpest turning radius (15.1 feet) in the class. and a dynamic sounding 4 speaker 140-watt AM/FM/CD/MP3 with USB/iPod® input. Every Mirage variant also features thoughtful interior design touches including ergonomically designed driver controls and instrument panel as well as upscale-looking rich high-gloss piano black trim for the center console. An especially welcome interior design feature is the 60/40 split folding rear seat that allows for plentiful and easily accessed interior cargo volume. and a Bluetooth® hands-free phone system. and Exterior lower body kit and Chrome accent packages. Powering the all-new Mirage is an extremely efficient 1.2-liter three-cylinder DOHC engine that features the latest version of Mitsubishi Innovative Valve timing Electronic Control (MIVEC) variable valve-timing system that maximizes fuel efficiency and power output while greatly minimizing exhaust emissions. This engine produces 74 bhp and 74 lb.-ft. of torque. Consumers have a choice between a smooth-operating 5-speed manual and an advanced continuously-variable transmission (CVT) with Idle Neutral Logic. 5-years or 60,000-miles limited new vehicle and 5-years/unlimited mileage roadside assistance. Looks like they're showing the 14 inch wheels. They should have gone for the 15 inchers for the press photos! I can't wait to see what they have in store for us here in the US. I know we probably won't get the 1.0L (which would be nice), but I'm at least hoping for some higher trim models with all the aero goodies that the UK and Europe gets. Start/stop would be cool too, but since our EPA testing doesn't show the benefits of it I highly doubt we'll get to see it. They'll also want to keep the price down too I'm sure. I'm going to the big show to see it this weekend. I was at a Mitsubishi dealer on Monday looking at possibly buying a leftover i-Miev. While there, I asked about the upcoming release of the Mirage in the US. I read somewhere that a Sep/Oct time frame is expected, but I was told that there will be delays and that we will have to wait longer. How much longer, I don't know. Maybe he was just trying to get me to buy the lone i-Miev they had left. Mitsu has been oddly quiet about the US Mirage. Last week I was informed by a head office PR person that they would be releasing a NY show "pre-announcement" with some teaser info. But there has been no release, no teaser. Zip, zilch, rien, nada. Alas, we'll know very shortly. 1:30 tomorrow afternoon EST is the scheduled Mitsu media event at the show. PS: do you usually go to the NY show? Are you going especially to see the Mirage? Sure thing Darin. And no, I don't usually go to the show. In fact I've never been to the show before. I am going to see the Mirage. Hope the show is good and you get to check out the mirage well, and get some pics for us to have a look. Is this a useful link? News is out: it's the 2014 "Mirage" for the US and Canada. Very pleased about that. I'm going to update the first post with the official Mitsu news release.